Dyne Test Pens are a cost effective, quick and easy method to measure surface wetting or surface energy. Sometimes known as corona test pens or sherman pens the Dyne Test Pen is a simple method of determining the surface energy of most polymer based materials. Dyne test solutions are often used during plasma surface modification, corona surface treatment and flame treatment to determine the surface energy level and cleanliness of a substrate, especially within industries such as packaging and converting, automotive, aerospace, medical device manufacturing etc. Our Dyne Test Pens are equipped with a valve tip applicator and do not suffer the inherent disadvantages of the “Magic Marker” or “Felt Tip Pen” type. To use simply draw the Dyne Test pen across the material surface, the liquid will either form a continuous film on the surface or draw back into droplets. If the Dyne test fluid remains as a film for 3 seconds or more then the material will have a minimum surface energy (Dyne level) in mN/m of that ink value. Should the Dyne test liquid draw back into droplets in less than 1 second then the surface energy (Dyne level) of the substrate is lower than that of the liquid value. The exact surface energy (Dyne level) can be determined by applying a range of increasing or decreasing values of Dyne test pens. 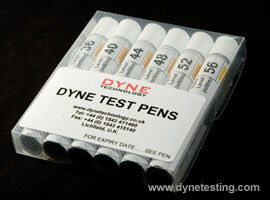 Dyne Test Pens are available in a range of values from 30 to 72 Dynes/cm (mN/m) and are supplied in disposable pens. The test fluid contained within the pens is to ISO 8296 with additional high visibility dye for easy readings. 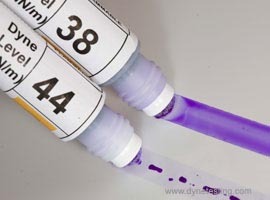 Various packs of Dyne Test Pens (to ISO 8296) are available. If you cannot see the range you require below, please contact us and we will be happy to meet your specific requirements.